If you are looking to buy a home in Davis County it may be a good idea to check into the housing market and do a little research. Don’t worry, we have you covered. Let’s take a minute to look at what the housing market is doing in Davis county and where it might be headed and what this means to you. Davis County has had interesting trends compared to other surrounding counties but has had similar trends. The trends have not been as dramatic however. Before the housing market crash in 2008 home price medians in Davis County sat around $230,000 at it’s peak. 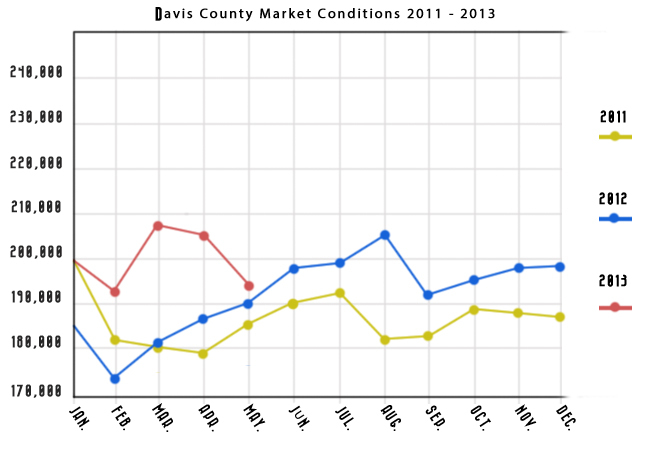 Through 2010 the housing market in Davis County did take a hit but it wasn’t as bad as you would think. It was actually in 2011 that home prices hit their lowest. Two years ago the median price for a home in Davis County was $179,000. While prices haven’t haven’t shot back up there are signs that home prices might again be on the rise. Check out the graph below to see what has been happening in the market over the last two years. The housing market in Davis County has been a slow and steady climb. It has climbed and dropped but is in a general upward growth. The median price for a home sold in Davis County as of April is $205,000. That is an increase of nearly $30,000 compared to 2011. We aren’t back to where we were in 2007 but we are headed that way. It isn’t going to happen overnight either, but we will continue to make slow and steady progress back there. Why are raising home prices good? This is because the housing market generally determines other factors in the economy. Usually when people are buying and competing for houses that means consumer confidence is high and people are willing to spend money. When people are spending money the economy grows. Also when people buy homes it creates multiple jobs for others which means more money is being distributed. What does this mean for the home buyer? You obviously want to get the best price on a good home. With rising home prices you aren’t going to want to wait to see what happens because it is likely that home prices are going to go up. While home prices might fluctuate from month to month if you are serious about settling down in Davis County you will save money by buying now. Start your home search today by visiting utahhomesforsale.com/davis-county and find the best prices on a new home.